File Navigator for Excel (Explorer for Excel) is a powerful solution for organizing, navigating and managing Excel workbooks. The File Navigator for Excel add-in visually organizes all open Excel workbooks in a tree view explorer to easily navigate between spreadsheets, drag sheets throughout workbooks, rename, delete, resort and insert multiple worksheets with a click. Quickly navigate through Excel worksheets and workbooks. Insert, copy, rename, delete and sort worksheets with options. Drag worksheets through workbooks for efficient organization. View all workbook names in a tree view and rename or delete them in one click. Manage workbooks comments quickly and easily. Organize workbook links, navigate with them find their sources and update them. Manage hyperlinks found in workbooks. View all errors and conditional formatting in all open worksheets. Manage custom lists in Excel by creating new lists or editing and deleting existing lists. 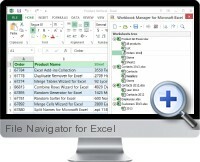 File Navigator for Excel is also available at a discounted price in the Excel Add-ins Collection Download.